Return the number of families assumed in the standard model. Return the electroweak scheme used. Set the electroweak scheme used. The electromagnetic coupling for vertex classes in a well defined self-consistent EW scheme if requested. Return a pointer to the object handling . The vector charged lepton- coupling. The axial charged lepton- coupling. Return a pointer to the CKMBase object used. Return the square of the elements of the Cabibbo-Kobayashi-Maskawa Matrix. Return the number of colours. Return the number of avtive quark flavours for a given scale. Return the constant strong coupling constant. Return the running strong coupling for a given scale. Return the for nflav active flavours. Return the for the given scale. Pointer to an object capable of calculating the running . Coupling between a fundamental fermion and the photon. Vector coupling between a fundamental fermion and Z^0. Axial coupling between a fundamental fermions and Z^0. If true, the electro-weak couplings are derived from in the initialization. A pointer to an object representing the Cabibbo-Kobayashi-Maskawa matrix. The matrix of squared CKM elements set from theCKM at initialization. Option for the calculation of the W/Z widths. StandardModelBase is used to handle standard model parameters in an EventGenerator. It uses AlphaEMBase, AlphaSBase and CKMBase to help with the implementation of the electro-magnetic and QCD couplings and the flavour mixing matrix. This means that StandardModelBase does not need to be inherited from when it comes to standard model parameters. Beyond the standard model parameters should be implemented as sub-classes. 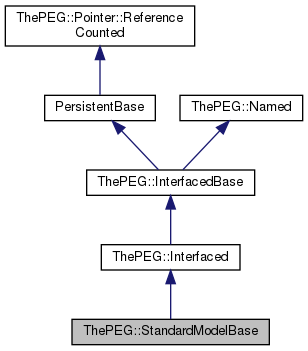 The interfaces defined for StandardModelBase. Definition at line 38 of file StandardModelBase.h. Declare a pointer to an AlphaEMBase object. Definition at line 41 of file StandardModelBase.h. Declare a pointer to an AlphaSBase object. Definition at line 43 of file StandardModelBase.h. Declare a pointer to n CKMBase object. Definition at line 45 of file StandardModelBase.h. Declare a transient pointer to an AlphaEMBase object. Definition at line 47 of file StandardModelBase.h. Declare a transient pointer to an AlphaSBase object. Definition at line 49 of file StandardModelBase.h. Declare a transient pointer to a CKMBase object. Definition at line 51 of file StandardModelBase.h. Return a square of the element of the Cabibbo-Kobayashi-Maskawa Matrix. The fatrix element for the uf up-type family and df down-type family.